Most women are very familiar with how to deal with the traditional signs of aging such as their crow’s feet, forehead wrinkles or grey hair. However, these are not necessarily the areas that are belying your age. There are a whole range of lesser-known signs or areas to look out for that could be adding years to your appearance. Most people have never heard of these areas and have no idea what solutions there are to fix them to look younger. These are all dead giveaways that you are not as young looking as you feel or looking more sad and tired than you really are. Bunny lines are the wrinkles on both sides of the nose, right below the bridge and the lines around the top of your nose when you smile. Bunny lines are cute on a bunny but if they are there when you are not smiling they are not very cute. How can you get rid of these nose crinkles or wrinkles? Relaxing the muscles on the side of your nose with a muscle relaxer like Botox, Dysport or Xeomin is the best way to decrease the muscle movement of the side of the nose and thus decrease or soften these nose wrinkles or bunny lines. Permanent lower eye bags, tear trough, eye trough, dark circles under eyes and under eye hollows are all terms people use to describe problems under their eyes that make them look tired. Deep lines and dark shadows under the eye may be a sign of aging. They may also be a variant of normal but not matter what you call the problem, it is still a problem for many people and the problem cannot be fixed by a good night’s sleep. A true tear trough is a fold that extends from the inner eye corner, running down and outwards and creating a hollow which can be deep enough to create a dark shadow. Sometimes the darkness is made worse by the thinning skin of the lower eyelid, allowing blood vessels and muscle color to shine through. Tear trough deformities are almost guaranteed to make you look older and more tired than you really are, as they cause the eye to look sunken and the area around it to look shadowy and dark. Similarly, lower eye lid bags cause all the same problems but they are really a result of loss of volume in the cheeks and this results in that tired aged look. Tear trough filler is the most cost-effective tear trough treatment. These injections fill in the hollow and therefore remove the shadow. While Juvederm and Restylane are the most common filler used for lower eyelid hollows, Bellafill is the best filler for the tear trough. It can be placed more superficially than the other fillers and this results in a more precise, smooth and natural look. The price of Bellafill is often a little more but it is a long-term filler that rarely must be repeated so that in addition to being the best tear trough filler it is also the most cost effective in the long run. Remember that the results for fillers under the eye can vary so be very careful when choosing a provider. Tear trough implants are an option but these implants are expensive and have many potential complications that a tear trough filler does not have and I do not recommend them. Laser for lower eye lid bags is an option but lasers generally just tighten the skin. This does not really resolve the problem which, in the end, is almost always related to some type of volume loss or deficiency. Fat grafting is used by some physicians to treat under the eyes but the results fromm fat grafting can be very unpredictable. Almost all the signs of aging are due to the volume loss that occurs as we grow older. One area that does not get much attention is the brow and forehead area. As volume is lost in the brow and forehead, the forehead and eyebrows begin to droop. This often results in forehead wrinkles as we try to raise our brow back up. In addition, as the brow begins to sag, the tails of our eyebrows fall and begin to lose their height, giving the appearance of pulling the face down and contributing to a sad, tired look. 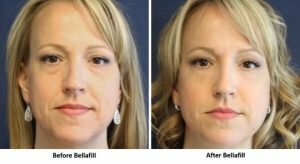 Fillers like Bellafill can restore this lost volume and help to raise the eyebrows to their former position, which opens the eyes and gives us back a more awake, refined and youthful appearance. Botox is another alternative but it will not raise the brows. Botox relaxes the muscle of the brow and is therefore best for softening the wrinkles of the brow. Laugh lines or smile lines that start by the nose and go down beside your mouth are called nasolabial folds. These lines can run into the marionette lines or the vertical lines that run downward from the outer corners of your mouth to along the outside of the chin. These lines can give the face a serious and sad look. They can dramatically age a face and contribute to a person looking sadder, or older than their years. Nasolabial lines are also among the first wrinkles or signs of aging to develop, and you might even start to develop these lines as early as your twenties. This is not mean you need to treat these laugh lines at this point, but it is an indication of how you will age. The best treatment option is almost always a filler for these areas. 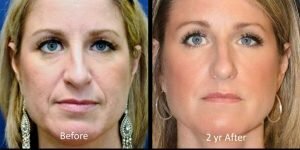 We have many laugh line or nasolabial fold treatment and marionette line filler treatment before and after photos here for you to review. Again, as we grow older or get a little but more mature, we lose volume is the tissues of our face and one area that is often overlooked early in the aging process is our lips. Later, when the lip lines or smoker lines or lip bar codes start to appear, is when most women start to deal with this area but a thinner lip is an early sign of aging that is easily fixed with filler. There is a caution here in that too big a lip does not look good but a little added volume in the lip can result in a more youthful look. American and Canadian board certified plastic surgeon Dr. Brian Windle is available to answer any questions you might have about facelift surgery neck lift surgery or all the fillers like Bellafill which is a permanent filler or any other plastic surgery procedure. To learn more about the benefits of the procedure schedule a consultation today. One more thing. I do believe that there are several travel insurance websites of reliable companies that permit you to enter your vacation details and acquire you the estimates. You can also purchase the international travel cover policy on the web by using your credit card. All you have to do is usually to enter your own travel information and you can begin to see the plans side-by-side. You only need to find the system that suits your financial allowance and needs and use your bank credit card to buy the item. Travel insurance on the internet is a good way to take a look for a reputable company for international travel cover. Thanks for sharing your ideas.